The symbolism found in Grimm's Fairy Tales preserves racial heritage which reaches back to the times of Abraham Isaac and Jacob/Israel. Will cause you to take another look at those bedtime stories mother used to read aloud. Children for many generations will forever be grateful to the Grimm brothers Jacob and Wilhelm for preserving the Fairy Stories for them to enjoy. But not only the children are grateful. Men and women of every clime and country are grateful. Except for the efforts of these two men more than 200 stories might have been lost forever to posterity. The Brothers Grimm have assured for these simple stories an important niche in our cultural and our spiritual heritage. Yes there is a spiritual content which cannot be ignored. For many of the stories tie in very closely with the stories in the Bible. They are particularly valuable to us for their preservation of the racial heritage which reaches back to the times of Abraham Isaac and Jacob the Patriarchs of the Old Testament. They give evidence of the highly Christian character of the Saxon people as these stories are saturated with Bible truths. 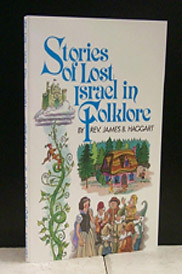 The symbology of these tales can be compared with the highest symbols of the Bible. Indeed many of the symbols of Revelation and Daniel are interchangeable. So immersed were the Saxon people with the Bible content that every fairy tale is flavored with the message that the Holy Word holds. Many suppose that the Grimm Brothers were the authors of the Fairy stories termed The Household stories of the Brothers Grimm. They did not create or originate the stories. They merely wrote down for posterity the old folk tales that were passed on from house to house and generation to generation at family gatherings around the open hearth . . . The brothers were quite aware of the tale's magic attraction for children but they suspicioned something in them of a far deeper value. To Jacob and Wilhelm Grimm they were a strong and vital narrative of the Anglo-Saxon half-forgotten past. They wanted to rescue this their racial heritage. To recover these precious gems and restore them for posterity became their sacred task . . .
To add even more to the book's appeal he has included sketches in pen-and-ink of several famous landmarks of the area as he made forays into the Land of Once Upon a Time and visited the places in Hesse associated with the stories beginning in 1956. His sketches illustrate effectively the quaintness and beauty of the old Post-and-Beam structures along what is now called The Fairy Tale Street that have undergone a splendid program of preservation to the great delight of the areas visitors. This book will give you a whole new concept of the fairy tales of your childhood.